Women Artists of All Ages from Allegany County NY and surrounding Areas are invited to Join the 9th International SWAN Day Celebrations! The official date for the 9th International SWAN Day is Saturday, March 26, 2016. OUR SWAN DAY ACTIVITIES HAPPENED FROM March 19th to April 1st. 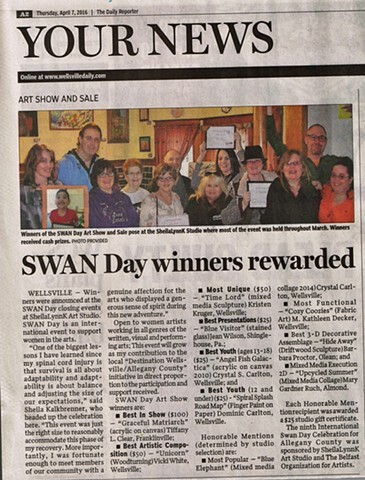 Thank you to the Wellsville Daily Reporter for publishing our list of SWAN Day winners!